It's Weird Al's world, the rest of us just live in it. Baby deer included. Last night found me in the audience for Weird Al Yankovic’s show at the Van Duzer Theatre, and while I feel like my younger self might have had some snarky things to say about that, at this point in time I have nothing but respect for Al. He knows who he is and what his audience wants from him, and he gives it to them. Perform “Fat” in vintage fat suit? Check. Sing “Eat It” to the tune of that acoustic version of “Layla”? Check. Two songs about “Star Wars” as the encore, closing with “Yoda”? You wanted it, you got it. 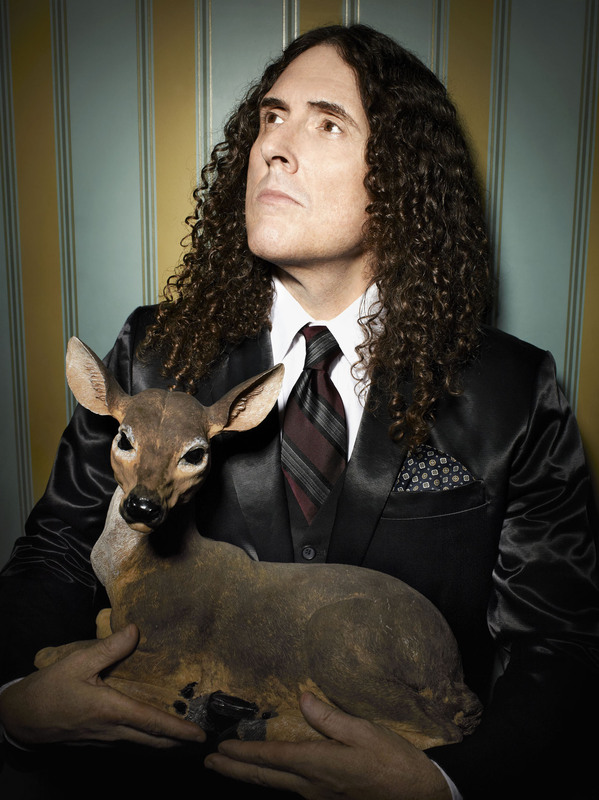 After more than 35 years in the business, Weird Al has carved out a niche that is entirely his own. Song parodies are still his bread and butter, and he still plays the accordion, but he has become an all-around entertainer who puts on a solid, professional show from beginning to end. His entrance was inspired: the band started the first song with Al nowhere to be seen. Then he appeared on the projection screen, singing with a recognizable part of the HSU campus behind him. The camera followed him as he made his way across the quad and into the building, where the crowd, of course, went nuts. The energy level stayed pretty high throughout, the songs interspersed with video highlights from Weird Al’s career that covered the many costume changes. Highlights for me were the Devo-inspired “Dare to Be Stupid” – for which Al and band wore yellow radiation suits and red energy domes – and “I Wanna B Ur Lovr,” which despite its goofy intent achieved an impressive level of genuine funkiness. If I was going to sum up this show in one word it would be, perhaps surprisingly, “triumphant.” Weird Al has outlasted all his detractors and many of those he’s parodied, he has a loyal and adoring audience that covers a wide spectrum of demographics, and as the flaming wreckage of the music business falls around him, he is laughing all the way to the bank. It’s inspiring, in a funny sort of way. The old saw from William Blake says that “If the fool would persist in his folly, he would become wise.” Weird Al is not a fool, but a foole, as in a jester; and by persisting he has become, in his own particular world, the king. Long may he reign. This entry was posted	on Wednesday, September 2nd, 2015 at 2:47 pm	and is filed under Dancing about architecture. You can follow any responses to this entry through the RSS 2.0 feed. You can leave a response, or trackback from your own site. Did they play I Lost on Jeopardy? Yes, as part of a medley. They also showed two video clips from “Jeopardy”: one where the answer (question) was “Weird Al,” and the person had no idea; one where all the categories on the board were based on Weird Al songs. I think having a Weird Al parody or your song must be the ultimate achievement in music.